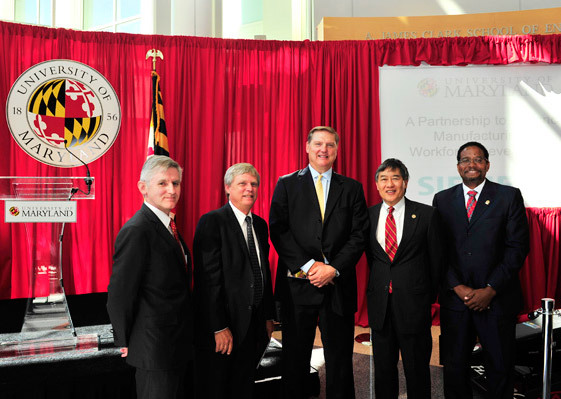 (From left to right): UMD Vice President and Chief Research Officer Dr. Patrick O'Shea, Siemens PLM Software President and CEO Chuck Grindstaff, President and CEO of Siemens USA Eric Spiegel, UMD President Wallace Loh, Clark School Dean Darryll Pines. COLLEGE PARK, Md. — The University of Maryland (UMD) and Siemens Corporation announced today the largest ever in-kind software grant from Siemens PLM Software. The in-kind grant has a commercial value of more than $750 million. Siemens’ product lifecycle management (PLM) software will provide UMD students and researchers with a uniquely valuable and sophisticated design and simulation tool for course work, research, academic projects and team-based competitions. This in-kind grant from Siemens gives students and faculty access to the same technology that companies around the world depend on every day to develop and manufacture innovative products in a wide variety of industries, including automotive, aerospace, biotechnology, machinery, shipbuilding, and high-tech electronics, among others. “We are very grateful to receive this valuable software from Siemens that will help our students develop innovative design capabilities and prepare them for advanced technology careers,” said UMD President Wallace Loh. UMD students and faculty will use the software in courses and research related to robotics design, bioengineering, space systems, product engineering, manufacturing, and systems life cycle analysis. Student groups will use the software in their efforts to compete in national and international competitions, including the Terps Racing Formula SAE and Baja teams, and teams participating in NASA’s X-Hab and Lunar Wheel Design competitions. “As product complexity continues to grow, students with PLM software experience are expected to be highly recruited. Global manufacturers need highly trained graduates to help them make smarter decisions that result in better products. This software grant enables UMD to integrate world-class PLM technology into its curriculum. The result enables students to be better prepared graduates to work in science, technology, engineering or math fields,” said Chuck Grindstaff, president and CEO, Siemens PLM Software. Access to the software will also help students to advance their professional careers after they complete their degrees. Graduates with Siemens’ PLM software training are highly sought after by corporate recruiters seeking candidates for advanced technology jobs. “Our students will benefit tremendously from using Siemens PLM software for course work, special projects, and international competitions, and their experience with the software will help them succeed in the workplace as graduates,” said Dean of UMD’s A. James Clark School of Engineering and Farvardin Professor of Aerospace Engineering Darryll Pines. "A modern economy requires modern investments. In Maryland, we’ve made the better choices to invest in a highly skilled workforce, world-class research facilities, high tech industries, innovative ideas and a growing community of entrepreneurs,” said Maryland Governor Martin O’Malley. “This partnership between Siemens and the state’s flagship university highlights our continued goal to equip our students of today for our jobs of tomorrow." The software in-kind grant represents an important component of the comprehensive partnership between UMD and Siemens Corporation, which includes student recruitment, as well as collaborative activities in energy, transportation, neuroimaging, biomedical devices, and fire safety, among other research and development areas. UMD is located just a few miles from Siemens’ USA headquarters in Washington, D.C., and recently hosted President and CEO Eric Spiegel as part of UMD’s Robert H. Smith School of Business CEO@Smith lecture series. Spiegel also serves on the UMD Energy Research Center Advisory Board. Siemens PLM software allows companies to manage the entire lifecycle of a product efficiently and cost-effectively, from ideation, design and manufacture, through service and disposal. Among Industry Week’s list of 1,000 manufacturing companies, more than half use Siemens PLM Software; in the key markets of automotive, aerospace, machinery and high tech, the total is close to 80 percent. NASA used the software to develop the Mars rover Curiosity. Calloway uses it to design golf clubs. And Space X has used Siemens PLM software to develop its Falcon rocket and Dragon space capsule. Siemens PLM Software is a leading global provider of product lifecycle management (PLM) software and services with seven million licensed seats and more than 71,000 customers worldwide, delivering open solutions to help its customers make smarter decisions that result in better products. Siemens Corporation is a U.S. subsidiary of Siemens AG, a global powerhouse in electronics and electrical engineering, operating in the industry, energy, healthcare, and infrastructure & cities sectors. For more than 165 years, Siemens has built a reputation for leading-edge innovation and the quality of its products, services and solutions. With 370,000 employees in 190 countries, Siemens reported worldwide revenue of approximately $102 billion in fiscal 2012. Siemens in the USA reported revenue of $22 billion and employs approximately 60,000 people throughout all 50 states and Puerto Rico. The University of Maryland is the state’s flagship university and one of the nation's preeminent public research universities. A global leader in research, entrepreneurship and innovation, Maryland is ranked No. 21 among public universities by U.S. News & World Report and No. 14 among public universities by Forbes. The Institute of Higher Education, which ranks the world’s top universities based on research, puts Maryland at No. 38 in the world, No. 29 nationally and No. 13 among U.S. public research institutions. The university is also one of the top 10 highest-rated D.C.-area employers, according to Glassdoor.com. Its faculty includes three Nobel laureates, two Pulitzer Prize winners, 49 members of the national academies and scores of Fulbright scholars. The university is recognized for its diversity, with underrepresented students comprising one-third of the student population.